Ashthorne House is a late Georgian property. This spectacular house and cabinet is now available to order. All components are designed using the latest CAD drawing programme and manufactured using state of the art CNC routing machinery. Floors are pre-grooved ready for hard wiring. (We are the only dolls house manufacturer to groove the floors as standard). Deep and high bay windows to allow display of goods etc. Purpose built cabinet with two sliding shelves. Delivery is approximately 28 days from date of order. 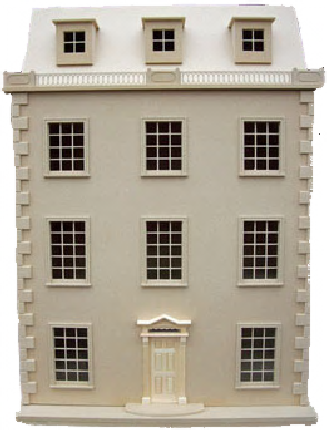 Please note: for ease of decoration, the windows, doors, internal/external moulding's, railings, etc, are not glued into place.